This time of year, it gets dark around 4pm in the UK and the sun doesn’t come up again till nearly 8am! This pretty much guarantees that if you are driving to and from work, you are going to be spending much of your journey in the dark. 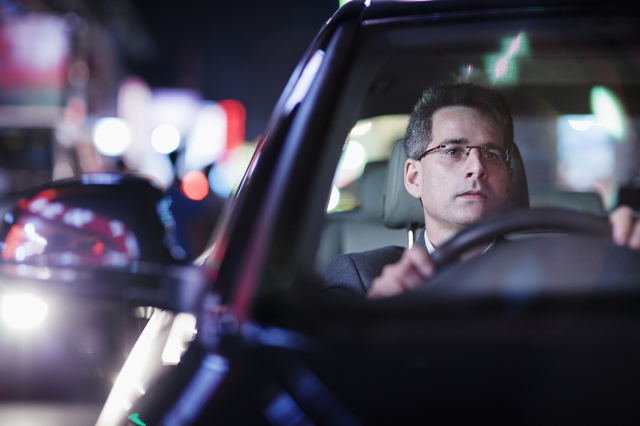 Driving in the dark can bring its own challenges and with reduced vision, it can be more difficult to spot hazards such as bends and junctions and to see vulnerable road users such as pedestrians, cyclists, and motorcyclists. There is much that drivers and riders can do to reduce the risk of being involved in an accident on the roads at night. If you have to drive a longer distance at night then plan the journey in advance. If you are going with other people who can legally drive the vehicle, then consider sharing the driving. Ensure that you and any other drivers are well rested before the journey and book overnight stops where necessary. Avoid driving at times when you would usually be asleep and take rest breaks every 2 hours. Vehicle lights are there for your safety and those around you – it is illegal to drive at night without fully functioning front and rear lights. You should also check that all lights on the car are in full working order and kept clean before you start a journey. It is important to ensure that lights are adjusted correctly and don’t dazzle other road users. You should also avoid driving on main beam when vehicles are approaching. The most obvious danger of night driving is decreased visibility. The distance a driver can see is shortened and so hazards can often seem to appear out of nowhere. It also takes time for the eyes to adjust to the darkness after being in a lit building or after driving on a well-lit road. As a responsible driver you should be prepared for the unexpected. To prepare yourself for any eventuality you should drive at a speed that allows you to spot hazards and react accordingly. The speed you choose should enable you to brake or manoeuvre to avoid a hazard without endangering those around you, and to stop within the distance you can see to be clear. Of course, speed limits should not be exceeded. Pedestrians may not have realised that you have not seen them. Cyclists are also difficult to spot, as their lights are not as powerful as cars. It can also be more difficult to spot the single headlight of a motorcyclist at night if they are around cars. In darkness it is harder to judge speed and distance and objects can be closer than they appear or travelling faster than first expected. This can be a problem, particularly for older road users. As we grow older, our eyes become less able to react quickly to changes in light and we can have difficulty with colours and contrasts in poor light. Between the ages of 15 and 65, the time it takes to recover from glare increases from 1 to 9 seconds. This could be the reason why some people find driving at night more difficult. Young drivers who have not built up experience of night time driving are especially more susceptible to collisions at night. Novice drivers can take a further driver training scheme called Pass Plus, which contains a night driving module and will provide some of the skills necessary for safe night driving. If you’re driving for work, you should be aware of your company’s driver hours and safe driving policies, you should check routes and journey plans with your line manager. ← Christmas decorations and parties – are you playing safe?